Worcestershire Sauce is a commercially-made seasoning sauce. The sauce is brown, and thin. It has a somewhat tart, meaty taste with a pungent vinegary smell. The most well-known brands include French’s and Heinz, and Lea & Perrins. Different brands will use different ingredients; some of the ingredients commonly used often include cloves, garlic, tamarind, paprika or chiles, soy sauce, treacle and/or molasses, vinegar (or lemon juice), salt, onions, garlic, anchovies, shallots, malt vinegar, and tamarind. Lea & Perrins is the oldest brand, and the original. Those who like Lea & Perrins will turn up their noses at the others. Lea & Perrins will barrel and age theirs for 3 years, and not all the other brands will do that. Lea & Perrins is made in a factory on Midland Road in Worcester, England. The ingredients in the recipe for Lea & Perrins are a closely-guarded secret, known only to those who manage the company and to those who trouble to read the list of ingredients on the side of the bottle: Malt vinegar (from barley), spirit vinegar, water, refiner’s molasses, sugar, salt, anchovies, tamarind extract, onions, garlic, spice, and natural flavour. The onions and garlic are pickled for a minimum of 12 months in malt vinegar before use. Eventually, the ingredients are combined, then aged in blue fiberglass maturing tanks (aging used to be done in oak barrels), strained, the flavour checked, then pasteurized and bottled. The British factory supplies the entire world except America. The reason is that Americans are the world’s largest consumers of Lea & Perrins, which justifies their own factory in Fair Lawn, New Jersey. The ingredients there are slightly modified: vinegar, molasses, high fructose corn syrup, anchovies, water, onions, salt, garlic, tamarind concentrate, cloves, natural flavorings and chili pepper extract. Brian Keogh, a Lea & Perrins accountant who retired in 1991, found what he believed were original leather-bound recipe books for the sauce in a trash skip used by the company. (No word on why he was rooting through the skip.) He died in 2006; his daughter Bonnie Clifford donated the books to the Worcester City Museums. The recipes he found seem to indicate that the “spice and natural flavour” could be cloves, soy sauce, lemon essence, peppers, and pickles. Knowing the ingredients, of course, doesn’t give away the secret to how they are assembled. For instance, it is known that the onion and garlic are pickled first in vinegar for a minimum of 12 months before being used in the recipe, and the anchovies are fermented in salt for three to five years. The sauce is pasteurized before being bottled. In Canada, the Lea & Perrins sold there is imported from Britain by Heinz. The label is modified to fit French on. Heinz also sells its own make of Worcestershire Sauce in Canada, under its own label. Worcestershire Sauce is very useful in quick recipes where the flavours don’t have time to marry and develop a body of their own. Maggi seasoning sauce, though it is less vinegary. Some people suggest substituting soy sauce, but that would change the nature of the taste too much — only the coloration is similar. There are recipes floating around out there for making your own Worcestershire sauce which have you “brew” it in the refrigerator before straining and using, but since you could more quickly walk to the corner shop, that hardly seems in the nature of a substitution, which has more to do with what do you have to hand right now. by which country’s law are you making a gluten-free determination? You need to contact the company whose brand you are considering buying and ask them directly, or, look for a bottle that is certified gluten-free. Reports as to whether Lea & Perrins is gluten-free vary wildly by time, by geographic location and by jurisdictional definitions, so contact them directly for your country if this is a concern to you. If you see malt vinegar as an ingredient, then in North America it is generally not considered gluten-free. A bottle of store-bought Worcestershire sauce does not require refrigeration after opening. 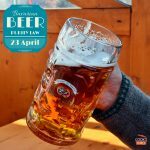 Some people, feel, however, that refrigerating it may extend its shelf life beyond that posted on the bottle for those who only use it infrequently. The British weren’t the first to make such commercially-prepared sauces a staple in their kitchens. The Romans did it before them, with their liquamen and garum fish sauces. John Wheeley Lea and William Henry Perrins were born within a few years of each other in the early 1790s. Both became chemists, and partnered on opening a few chemist shops (pharmacies) together starting in 1823 in Worcester, in the shire of Worcestershire in England. How exactly two pharmacists decided to go into the food sauce business is unclear, but one version with lots of promising details (such as names and dates) goes that in 1835 a fellow named Marcus, Lord Sandys, had returned from India, where he had been governor of Bengal. He had a recipe for a brewed sauce that he asked his local chemists (who happened to be Lea & Perrins) to have a go at making. They brewed it up, found it tasted awful, put the cask of it in the cellar, and got back to their regular jobs. A year later, on a lark before finally clearing the cask out of their basement, they had a taste of it. It had aged into a really tasty sauce. So tasty, that they paid Lord Sandys for the recipe, and were bottling and selling it out of their stores by the following year, 1837. Brian Keogh, who found the recipes books, went on to write a book called “The Secret Sauce – A History of Lea & Perrins”, published 1997. He felt that the story was untrue. He said he found that the male line of the Sandys ended in 1797 – 38 years before they were said to have met him. Nor did his research turn up any Lord Sandys having ever travelled to India, let alone been a Governor of Bengal. There actually was however a Lord Sandys during this period. Arthur Marcus Cecil Sandys, 3rd Baron Sandys (1798 – 1863), was born as Lord Marcus Hill. In 1860, under Royal license, he changed his title to Lord Sandys. He was a member of parliament from 1832 to 1852. In any event, by 1839, Lea & Perrins were exporting their product to America. In the 1880s, the Perrins family was rich enough to build a six bedroom stone holiday mansion, which they named “Plas Mynach” on Cardigan Bay in Wales. The house now rents out as a holiday home. In 1892, Lea & Perrins registered their name as a trademark. In 1904, Lea & Perrins received a Royal Warrant, which they have held since. The Lea & Perrins company was sold to the HP company (which makes HP brown sauce) in 1930. HP sold it to Heinz in 2005. The Lea & Perrins company was originally Bank Street and Broad Street in Worcester; in 1897, they moved to their present-day location on Midland Road. Lea & Perrins was made without sugar during the Second World War. The pickle was made from shallots, garlic, and vinegar. It is unclear why both “vinegar” and “acetic acid” are listed, unless perhaps it was to draw a distinction between two types of vinegar, such as malt vinegar and spirit vinegar. Scanned pages of the books can be seen online at the BBC site: http://news.bbc.co.uk/local/herefordandworcester/hi/people_and_places/newsid_8334000/8334468.stm (link valid as of October 2010). The book notes that in 1908, the weight of peppers used was reduced to 4 pounds and put back up to 5 pounds in 1909. Also in 1909, acetic acid was dropped. In 1917, the sauce started to be made without sugar. Worcestershire is pronounced “wus – tuh – sher”. Pronounce the “wus” part as you would “puss”, except with the “w” at the front. The correct spelling is “Worcestershire”, not “Worchestershire”, with a “h”. Alexander, Harriet. Secret Worcestershire Sauce recipe found: Historians believe they have found the original recipe for Lea and Perrins’ Worcestershire sauce, which could be 150 years old. London: Daily Telegraph. 2 November 2009. Apple, R.W. 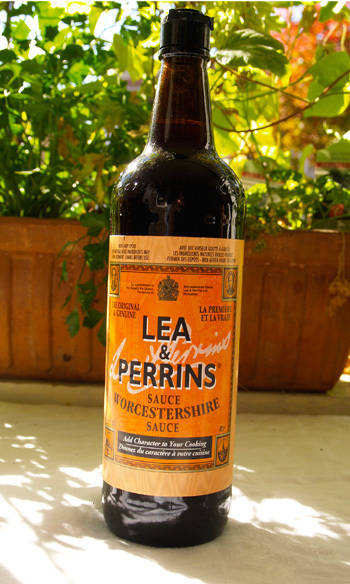 Don’t ask what makes Lea & Perrins Worcestershire so special — they won’t tell. New York Times. 30 August 2000. Bowles, Tom Parker. Worcestershire Sauce: a rare legacy of the Empire that nearly never happened… London: Daily Mail. 27 March 2010. Schlesinger, Fay. It’s out after 170 years, the secret of Worcestershire Sauce… found in a skip. London: Daily Mail. 3 November 2009.